Anne Bainbridge, whose husband Edward 64, was diagnosed with the disease in his 30's, said without our help, Edward would have stayed at home while their son, Nick, tied the knot last month. Edward, who lives outside Kendal in Cumbria, is unable to bear his own weight and so relies on others to lift him in order to transfer him from his wheelchair into a car if he wants to go anywhere. Usually Nick, who lives next door to the couple performs the task, but he was unavailable to do so on the day of his wedding. The plan was still for him to travel with his family in their car, however, and Edward felt he would be missing out if he did not join them. Thankfully, just a few days earlier, we had fitted a Milford Person Lift to the passenger seat of the car, which makes it possible for Anne to transfer Edward from his wheelchair and into the vehicle. 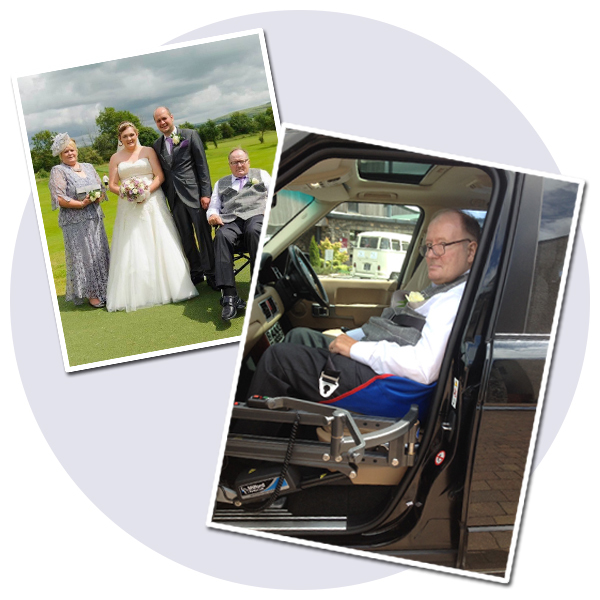 Safely seated and with his wheelchair folded up and in the boot, Edward was able to attend the wedding, which was help at a nearby registry office, as well as the reception at a local golf club. Anne said, "We live out in the country and so Edward has relied on getting out and about for company. A minibus takes him to a local day centre twice a week but otherwise he is totally dependent on other people to get him in and out of cars, which is a real effort. "Edward insisted he didn't want to get a wheelchair accessible vehicle, so we changed our car to a more suitable one and had the lift fitted. Autochair got everything sorted very quickly, which was wonderful because they did everything in time for us to go to Nick's wedding. "Edward would have missed out otherwise, like he has done on plenty of family occasions down the years, and although the Parkinson's has deprived him of any facial expressions, we could all see in his eyes how happy he was." Castle Taxis, the company that take him to the day centre had offered to take Edward to the wedding in the mini bus, but Edward wanted to be as normal as possible and travel with Anne their son and his best man. "We are so grateful and the lift means that Edward can rediscover the outside world again," said Anne. "His situation means that he is extremely isolated but now we are able to get him in and out much easier, even if it's just a case of taking him to a local garden centre, which is something we haven't been able to do for years."